We are overjoyed to be bringing you this delightful DIY tutorial today from Etsy artisan Judy with Angels N Everlastings! Judy's shop is filled with wonderful treasures, including these adorable seashell wreaths. She has kindly taken the time to share with us how she creates the wreaths for you lovely readers to make your own, especially if you are having a beach themed wedding. I'm turning it over to Judy now, please enjoy this tutorial and her sweet shop! If you spent some time this summer on a beach vacation or are fortunate enough to live close to the seashore, you may have a collection of seashells, sea glass or driftwood, that you or your family collected but don't know what to do with. Everyone in the family can get involved looking for special finds. If it's not possible to collect your own, or you want to add variety to those you found there are many sources on-line. You can search on Etsy for seashells or shop your local craft store. Michael's, A.C. Moore or Hobby Lobby all carry assortments of seashells. 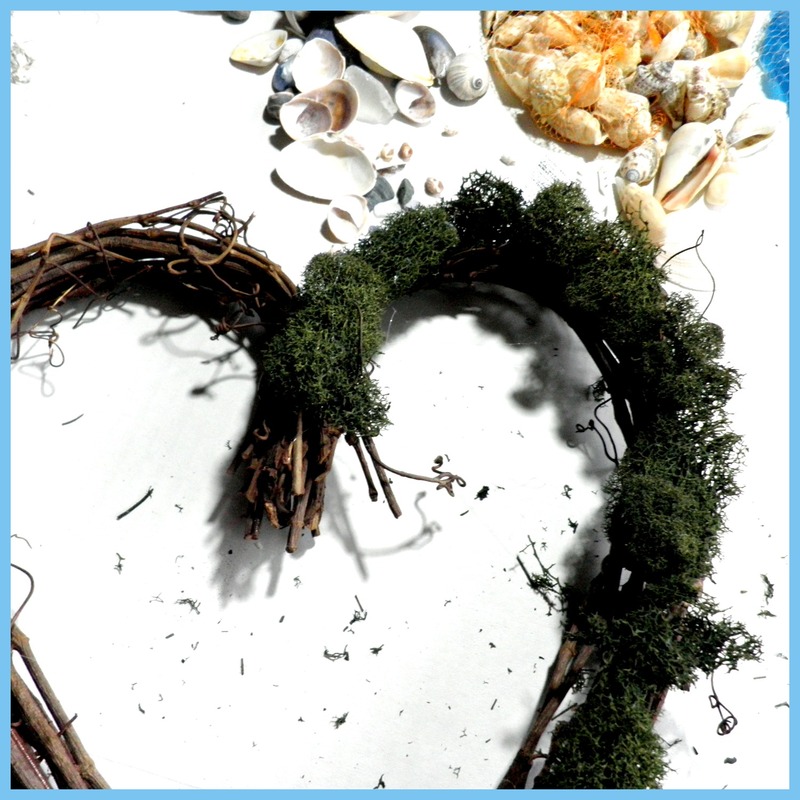 A seashell heart wreath would also make a great decoration for a beach wedding, The chosen wedding color can be added by using tulle or ribbon. Dried roses are also a nice addition. Hot glue gun and glue. 1. Cover your work space with newspaper or paper bag before starting to protect work surface. 2. Take your chosen wreath and add a hanger to back by taking a piece of spool wire and covering it with floral tape and feeding it through the back of wreath creating a loop. 3. Take your chosen moss and work around the wreath – gluing each clump to the wreath frame with hot glue. Gently hold each piece till glue starts to set. (be careful not to burn fingers – heat or glue may pass through the moss) Here we are using the green moss but silver grey spanish moss also looks nice. 4. Once the moss is set you are ready to start adding your decorations. You can use a bow if you'd like. 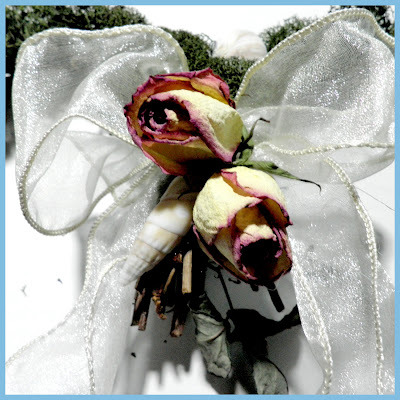 First we glued a shear off white bow in center and surrounded it with dried roses and shells. This makes a pretty focal point for the wreath. These roses I dried myself which is simple – check out instructions here. 5. 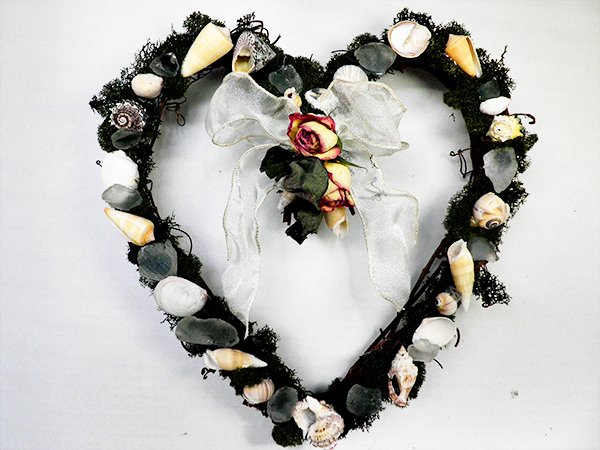 Now take your seashells and sea glass and place carefully around the wreath frame. You want to place them in a manner that the wreath will appear balanced. I like to mix the sizes and shapes – small and large. Once you get them placed – step back and give the wreath a good look. Make sure it looks balanced. Balanced meaning – in other words, that it doesn't look like one side is heavier than the other. It doesn't look like it will fall over. If so, reposition the shells so the large shells are evenly mixed. 6. Once you are happy with the shell placement, glue each piece to the wreath with your hot glue gun, holding each piece for 10 to 30 seconds till glue begins to set. Once everything is set, double check that everything is glued securely and add some hot glue under moss and apply pressure to make sure everything stays put. Using seashells you collected to make a beach themed wreath will give you something for your home that will be a pleasant reminder of family time spent together. I hope you enjoyed this seashell wreath tutoral. Please take a moment to visit my Angels n Everlastings Etsy shop https://www.etsy.com/shop/AngelsNEverlastings or my blog http://angelsneverlastings.blogspot.com/ for other seashell beach ideas. You can also find me on Facebook, Pinterest, and Twitter! If you have a wedding related DIY tutorial you would like to share with our readers, please send an email to info@savvydeetsbridal.com. GREAT DIY! So informative, with fantastic pictures :) Would love to make one of these some day. Thanks!!! This is a wonderful tutorial! Thank you for sharing this. Excellent tutorial! I wish we had such large pieces of sea glass around us. I collect lake glass but it is tiny in comparison. Wonderful tutorial, clear instructions, helpful pictures and the end result looks charming. Thanks for sharing your tutorial to us. Thank you for the opportunity to post this guest blog. I appreciate all the positive comments also. Lovely tutorial! Judy has such a beautiful shop. Great tutorial. You do great work. This is a wonderful tutorial. Fantastic pictures! very pretty wreath! thanks for sharing how to make it!